Guernsey FC boss Tony Vance hopes Bristol City loanee Jake Andrews will stay for at least one more game after his brace helped earn them a 3-3 draw at Sittingbourne. The Green Lions had their youngest matchday squad, with eight teenagers, as they came from behind three times. Dom Heaume added to the goals by Andrews, who was due to return to his parent club after the game. "He was outstanding again, unplayable at times," Vance said. 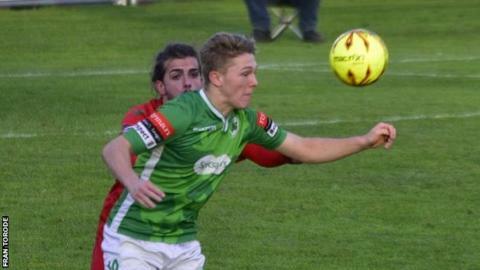 The result left Guernsey 21st in the Isthmian League Division One South table, nine points above the relegation zone. Andrews is one of two Bristol City players on loan at the Channel Island club, along with left-back Cameron Pring. "I don't want to get everyone too excited but hopefully we've got them both on Saturday at home, but we'll have to see," Vance told BBC Radio Guernsey. "If we can have the Bristol lads as well, I'm sure they'll want to do better than they did when they last played at home, because by Jake's standards he didn't have a great game."